We have had several things come up this year that have involved me taking meals to people. New babies, deaths in the family or friends recovering from surgery. The new baby meals are always exciting. The deaths in the family are always sad. The recovery meals always feel helpful. No matter the circumstances, people are always grateful for a meal. We have had two families in our neighborhood lose children this month. It's heart breaking. I can't imagine what the parents are going through. One was a high school student and the other was a four week old baby. 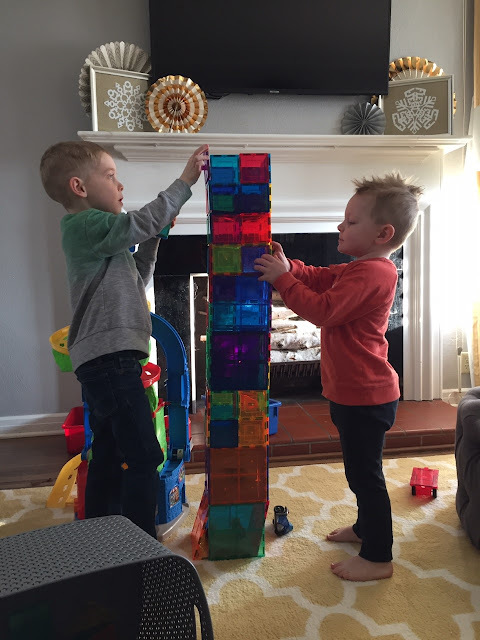 Olive's classmate lost the baby brother and we have had lots of sad conversations to process it all. There are a lot of unanswered questions, but we find comfort in knowing that we can love on our friends and neighbors by taking them dinner. I'm sure all the details of meal prep, grocery shopping and planning is at the bottom of their lists these days. I realize that delivering dinner isn't going to change their life, but it will let them know that others care about them in a very difficult time. I wanted to show you how I take people dinner to give you some inspiration. I also hope that it makes meal deliveries seem less intimidating for you. I used to feel shy about offering to bring people food, but not any more. I do it regularly and it is always well received. Even with I bring something as simple as rotisserie chicken and sides. No one expects me to bring them a gourmet meal. 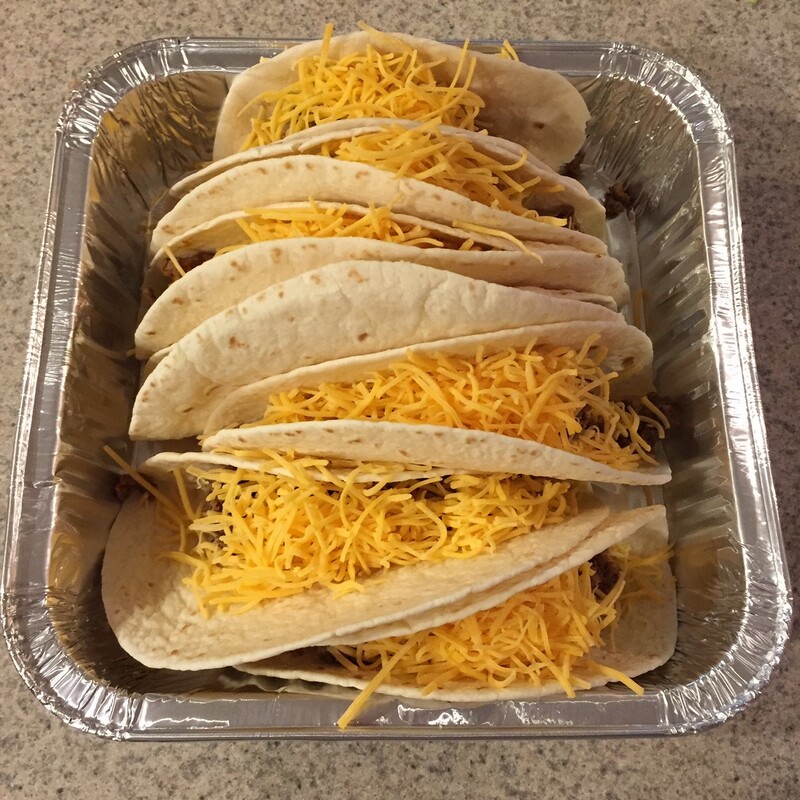 Any meal that is delivered to your door is a welcomed sight. I always ask about food allergies or food preferences when I am making dinner for another family. 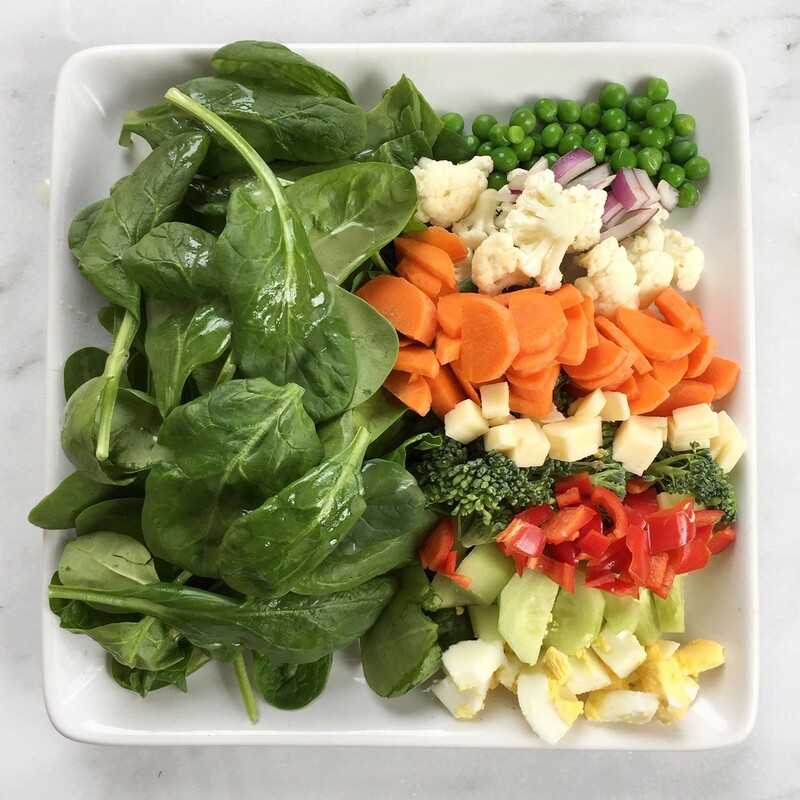 I try to bring an entree, simple sides of fruits and veggies and a little dessert. If I have time I'll throw in some muffins or something they can warm up for breakfast. I stock up on throw away baking dishes and disposable containers when I find a good deal on them. The square dishes are my favorite. 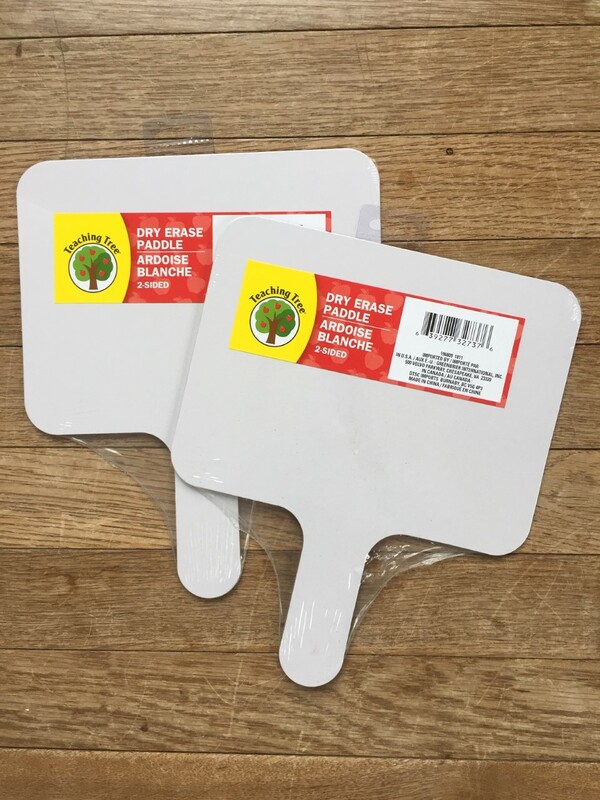 They are 2 for $1 at Dollar Tree - they are not super sturdy, but they work great for dropping off a meal. There's a section of my pantry that holds all of my meal delivery supplies. 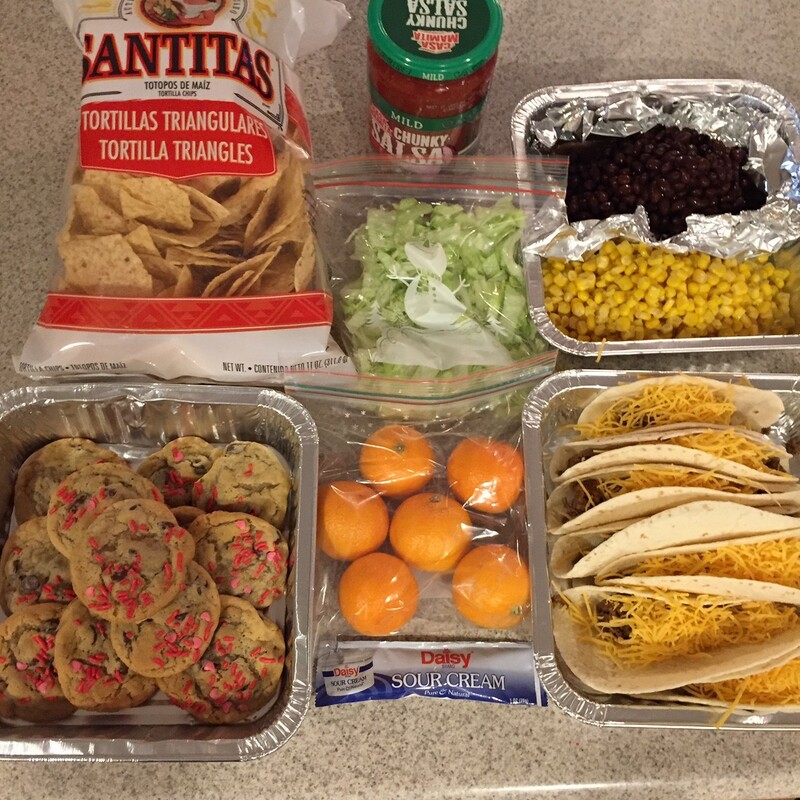 It makes it really easy to put together a meal to give away. I don't want the families to have to return anything to me. I also try to fix the same meal for my family. That way I just have to double my dinner prep and end up with meals for two families. I prepped all the soft shell tacos with meat and cheese. And left other toppings (salsa, beans, lettuce and sour cream) for the family to add as they wanted. 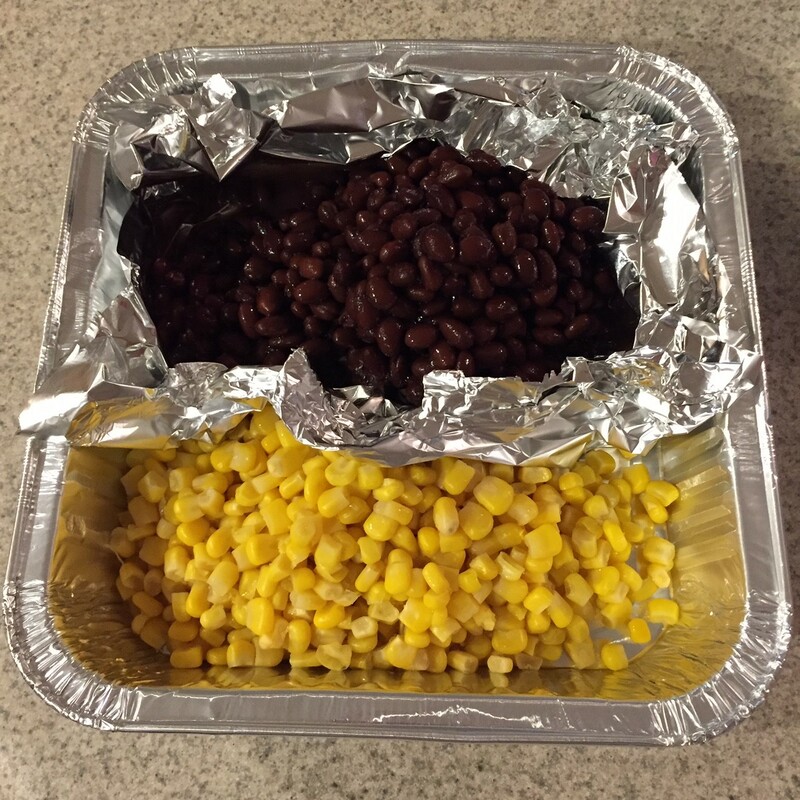 Sides of black beans and corn. I put the black beans in a foil pouch to separate them. This will make them really easy to reheat. 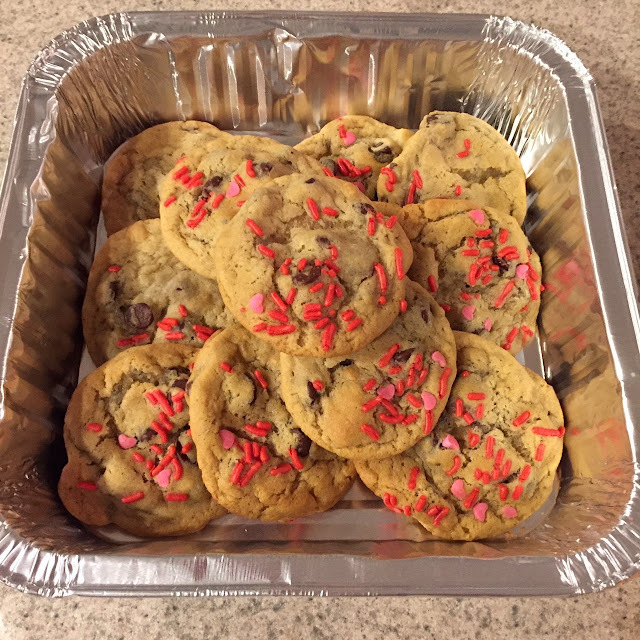 Who doesn't love some chocolate chip cookies?? 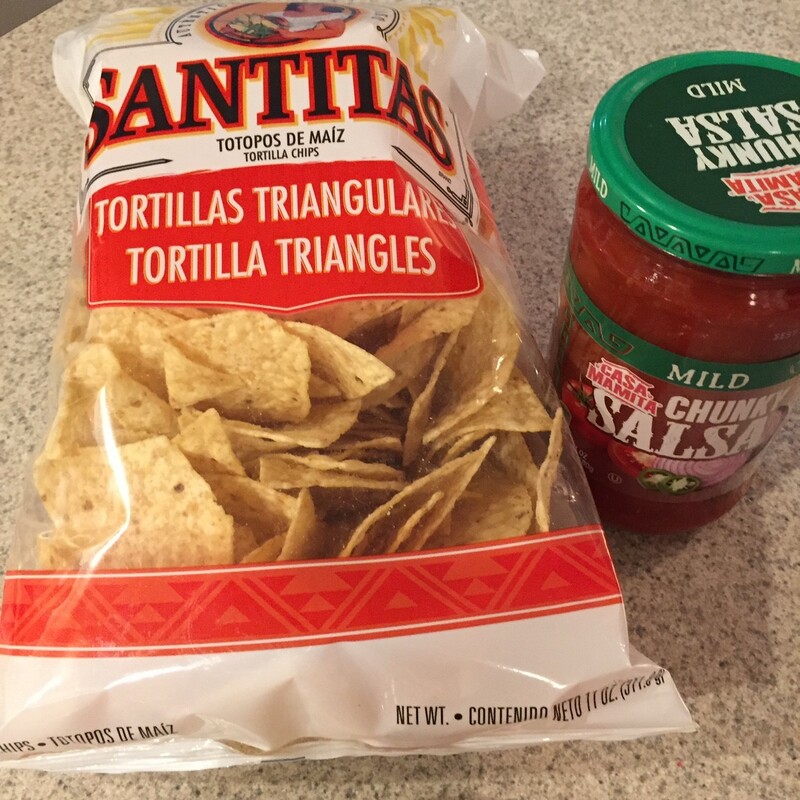 Easy side of chips and salsa. I always give them a brand new bag of chips and salsa that way they can eat with the meal or eat as leftovers later. Oranges or bananas are an easy side. 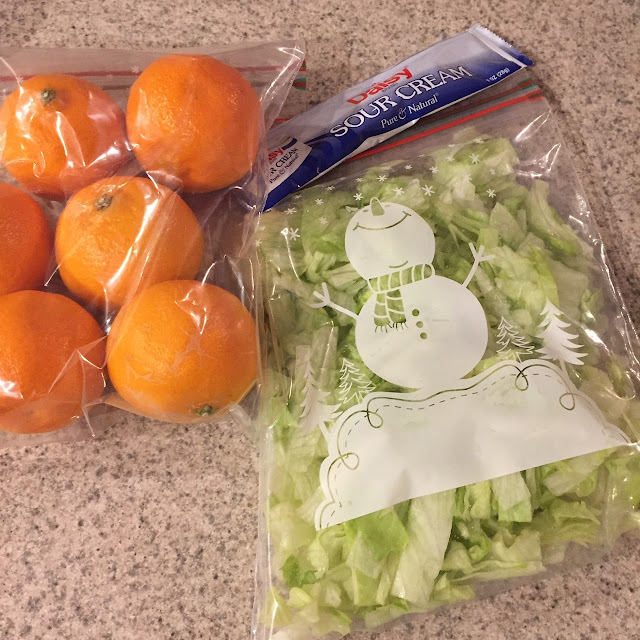 I chopped the lettuce ahead of time. 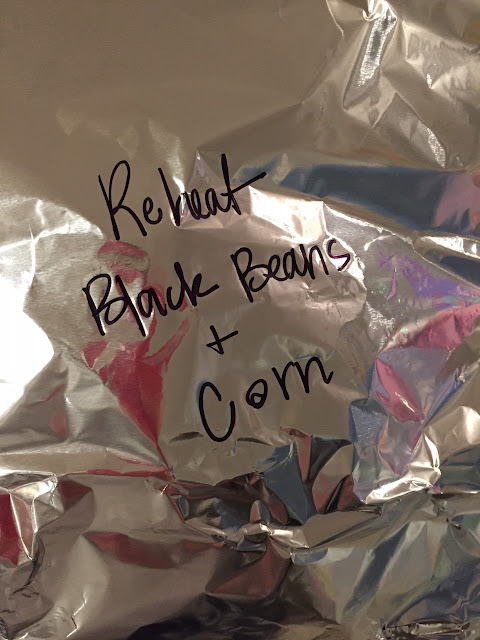 Cover everything in foil and write directions on top. 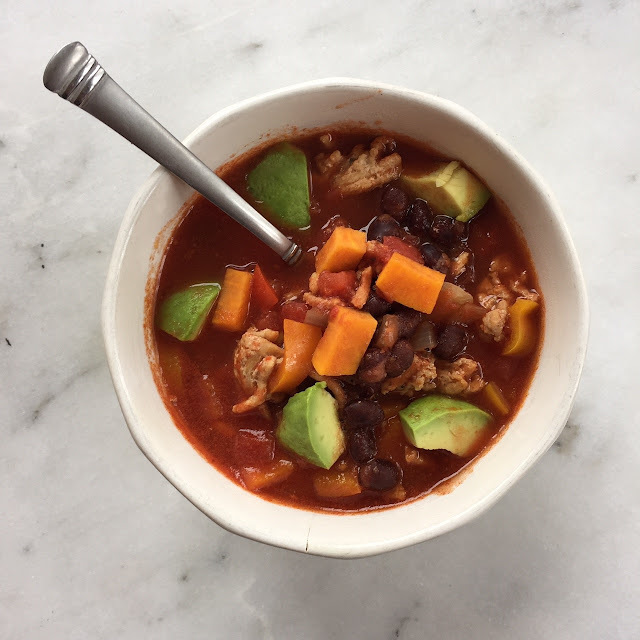 What are your favorite meals to make for friends and family when they need a little extra help?? I came across this recipe for 20 Minute Sweet Potato Chicken Chili from Physical Kitchness the other day on Pinterest and was inspired to create my own version. I love sweet potatoes, have been trying to eat more ground chicken or turkey in place of ground beef and I already had a lot of the ingredients. I have really been enjoying cooking and trying new recipes this year. I'm sure you've noticed because with all the recipe posts I've been writing for you in 2019. Brown the ground chicken with the seasonings. 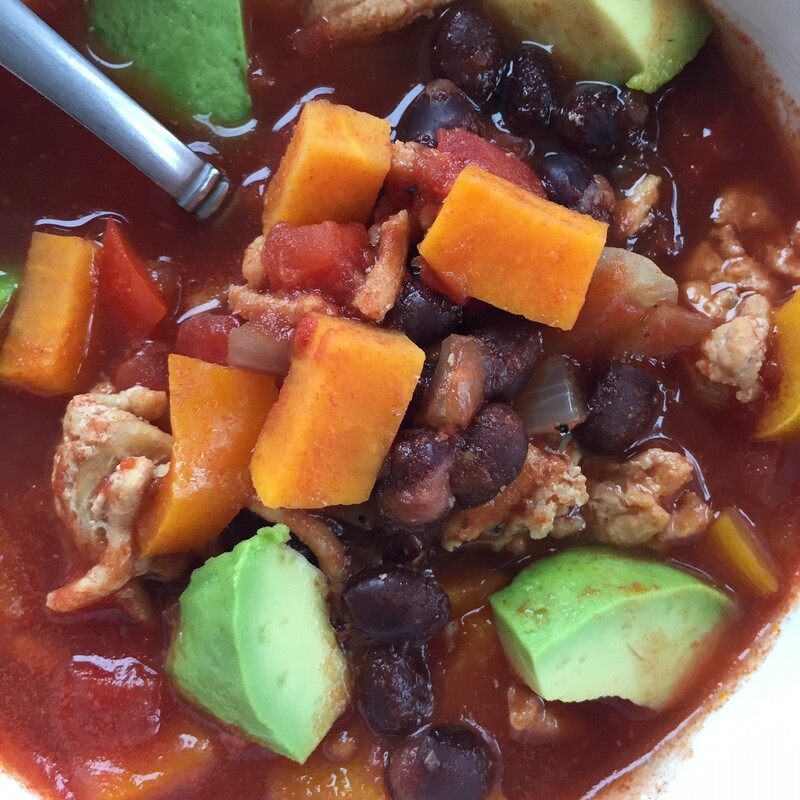 Chop all the veggies and dump everything into a big soup pot. Let it cook for several hours until the sweet potatoes are soft. This recipe served enough to feed us for 2 dinners and 2 lunches. It was really delicious. Reheats great. In full disclosure, only the adults at my house loved this soup. Kevin and I thought it was really good. Nothing we would change. My kids thought it was poison and opted for sandwiches instead. The kids did love when I made them individual charcuterie plates over the weekend. Fletch had a cold and I didn't want him sharing germs with everyone. This allowed for us all to have a snack type meal without passing any germs. 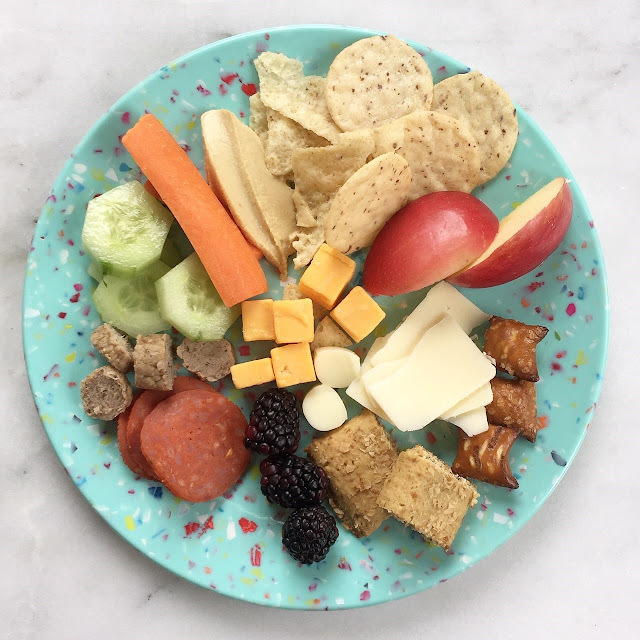 Some current favorite items - Almond Thin crackers, original hummus, extra sharp white cheddar cheese, peanut butter filled pretzels and honey crisp apples are a family favorite. 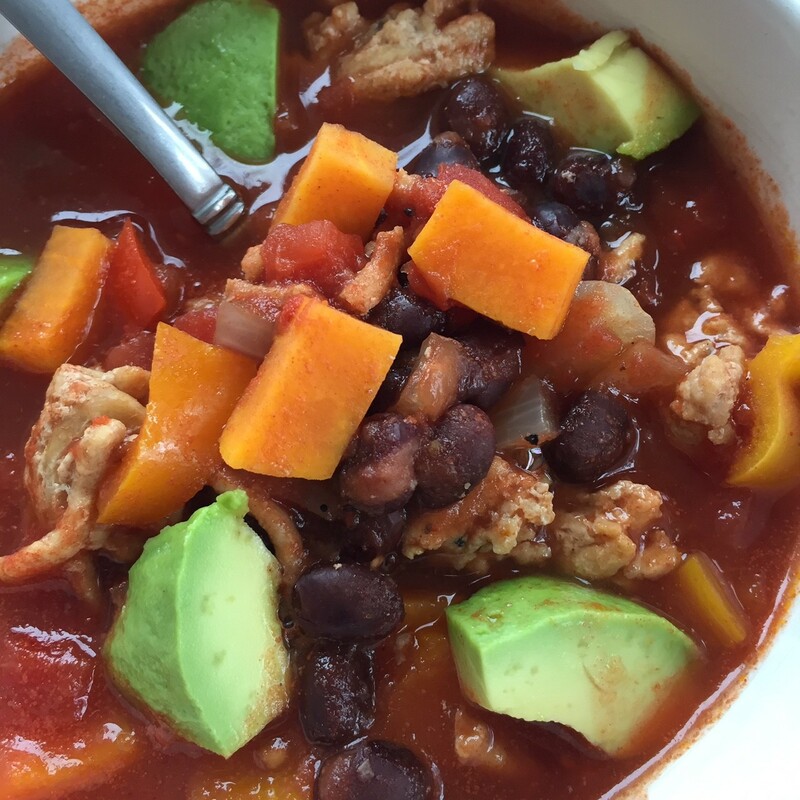 Would your family eat this Sweet Potato Chicken Chili?? It's no secret that I love TJ Maxx. I've shopped there for years. I look forward to buying so many things from there - shoes, hand bags, gifts, clothes, home decor, storage, lamps and more. It's like a treasure hunt every time you go in the store. There is something for everyone here. Just make sure to visit your store regularly, always be on the lookout for a variety of things and dig for a deal. You just never know what you will find so you've got to keep an open mind. Oftentimes I go in with a list of things to look for and then leave with nothing. Or I'll leave the store with a variety of things I wasn't looking for on that trip. Each store is a little bit different and it is fun to see the variety. Fletcher and I stopped in TJ on Friday and it was one of those trips for the books! 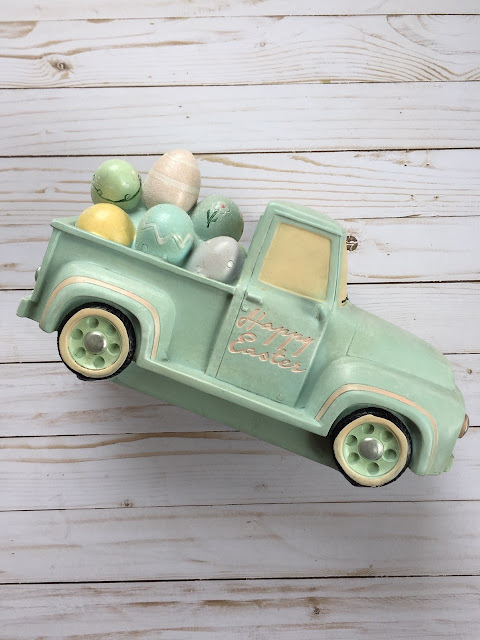 We found a little bit of everything - Easter basket fillers, home decor, gifts and potty training prizes - all for under $100. I really love TJ Maxx because you can get the best deals there. Fletcher loves it, too. We always start with stuff I'm interested in and finish our shopping trip with a stroll through the toy section. I've had my eye on a three tiered stand at Hobby Lobby for weeks. It's reg price of $99.99 but I know I could get it for 40% off. I loved it, but did not want to spend that kind of money on a stand. 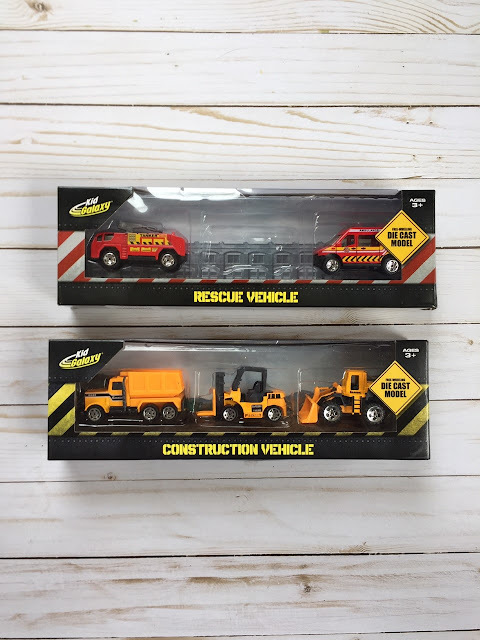 So I've kept looking for a knock off. I found a darling 2 tiered stand that better fits my needs for just $14.99 at TJ Maxx! I was thrilled. It pays to shop around and wait for something you just have to have. Hobby Lobby is an affordable store, but don't be afraid to keep shopping around for an even better deal. $14.99 Easter Egg Truck - it's even cuter in person if that's possible. 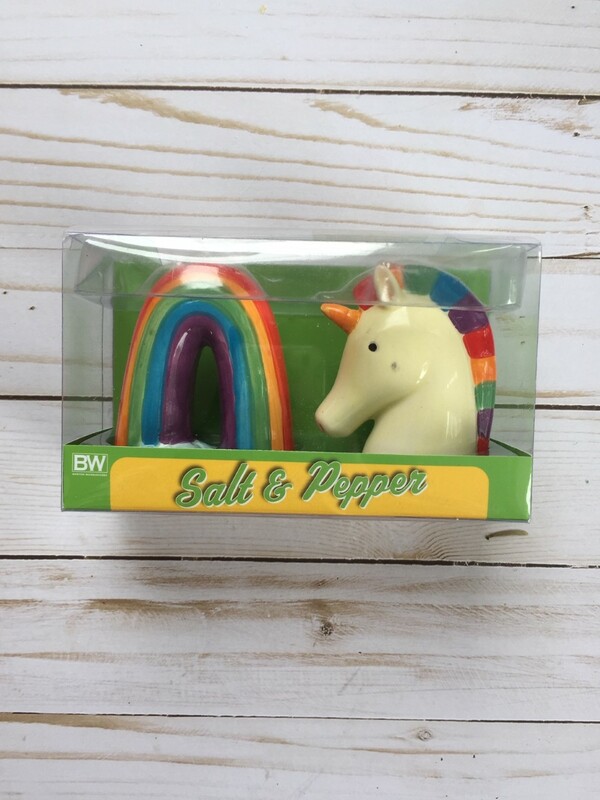 I try to pick up a little holiday decor for the kid's bedrooms and I thought this would be perfect for Fletcher. He loved it and it seemed like a good boy decoration. 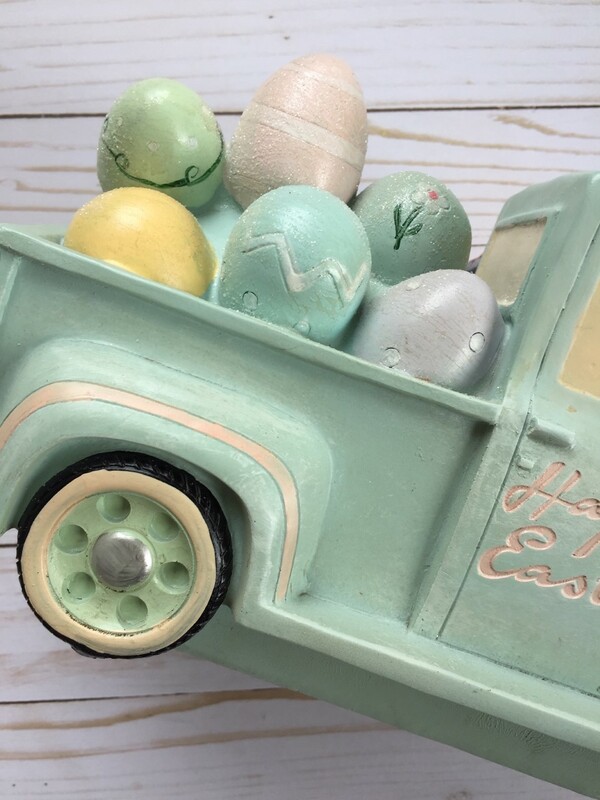 The eggs are each decorated with lots of details and each one is different. I thought this was a great deal for a unique item. My kids LOVE Playdoh. These will be going in their Easter baskets. 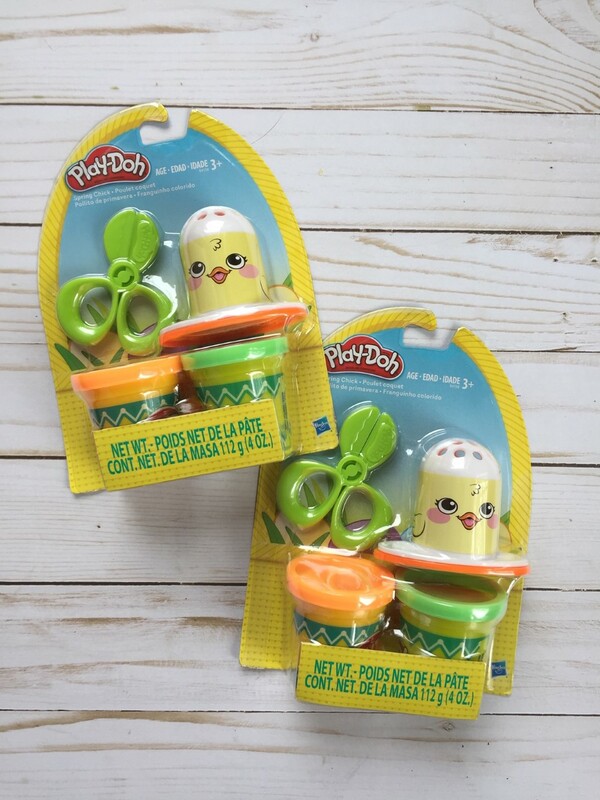 It came with a chick, scissors and two packs of playdoh. They'll have a blast giving the chicks hair cuts. My grandma used to collect S&P shakers so I always think of her when I see cute sets. I thought Olive would love seeing these out for St Patrick's Day in March. They're really sweet. Olive will love this bunny!! She's so sweet and the details are so charming. Her ears have wires in them which makes them perfect for posing. Her outfit and accessories are darling. What a steal! I love finding holiday decor for the kid's rooms that isn't fragile. She can play with this bunny all she wants and she'll be just fine. 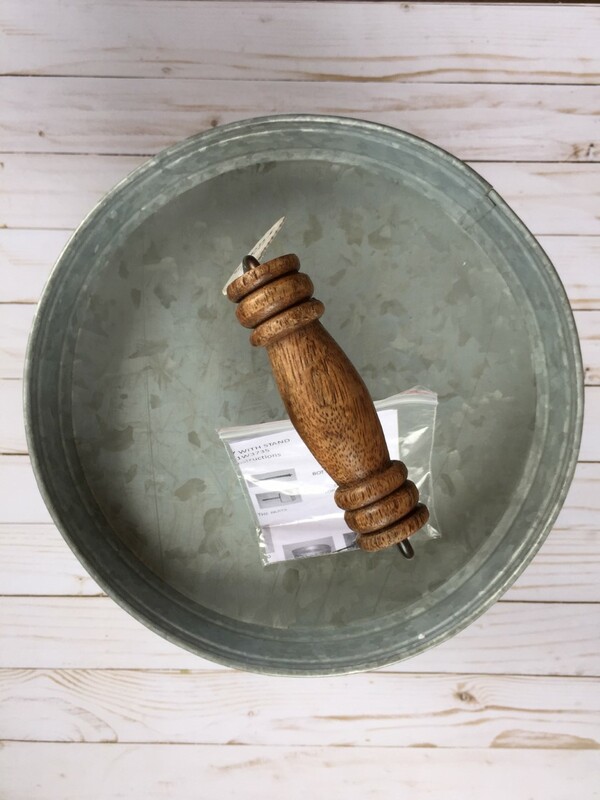 I'll be the first to admit that Farmhouse Style is not really my style. Yes, there are elements like ship lap, bright whites and galvanized metal that I enjoy. But you won't find me hanging a farmhouse sign on my walls, distressing all my furniture or adding many farm-ish things to my home. I did find this galvanized cake stand and it was love at first sight. 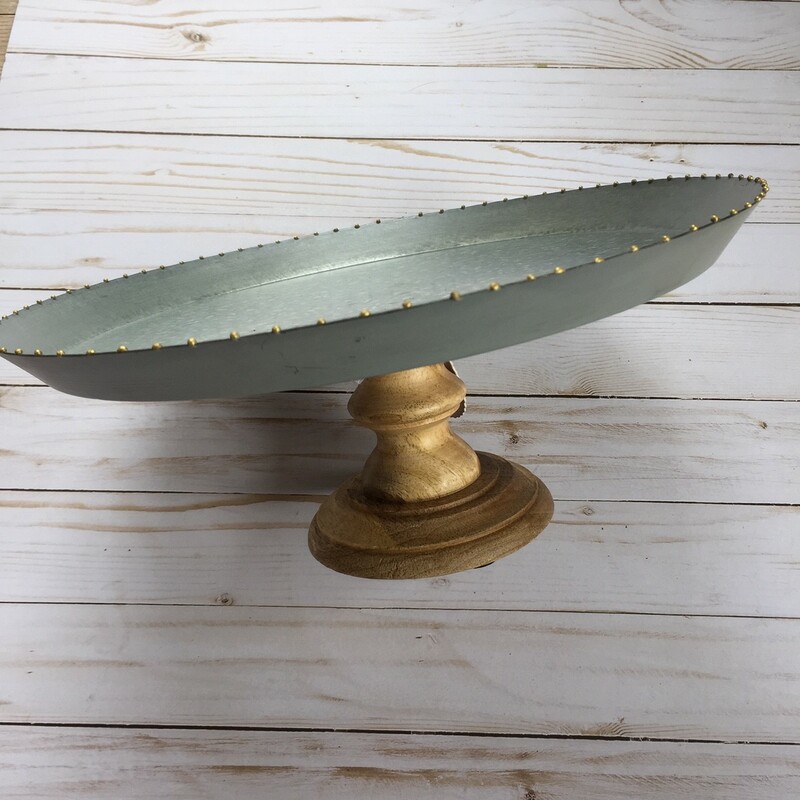 It's large, has gold polka-dots around the edge and it has the prettiest turned base. Sold!! It's been on my island all weekend holding cars and cookies. Remember that 3 tiered stand story from earlier in the post?? Here's my $14.99 solution! I love the handle, the plate sizes and the price could not be beat. 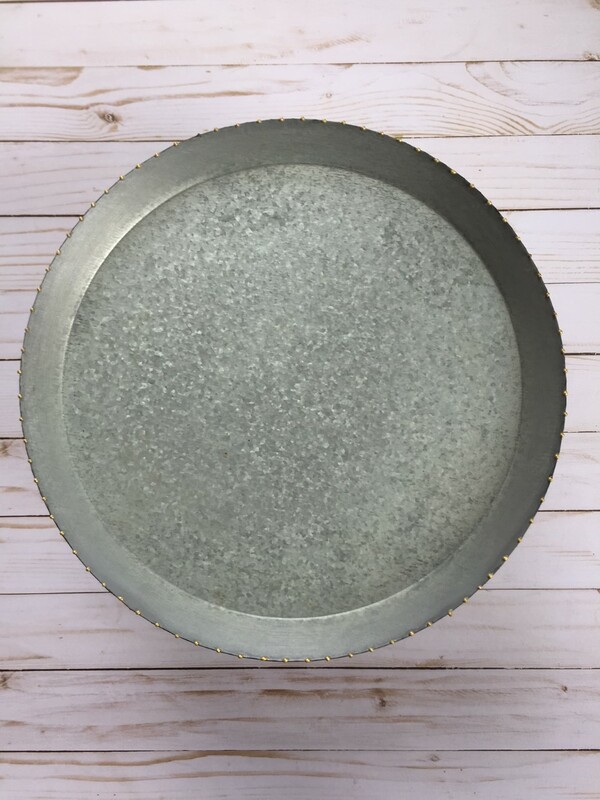 Watch for this to get accessorized in my kitchen as well as be the perfect addition to any party I host. 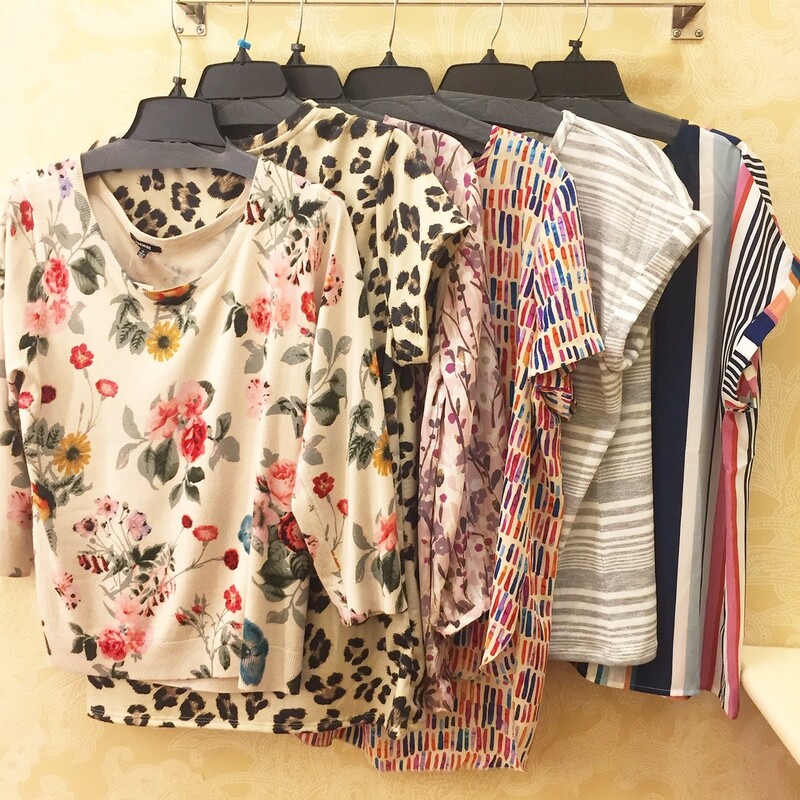 What's your favorite item from my TJ Maxx haul today?? If I was forced to pick, I would have to say the galvanized metal purchases. PS TJ Maxx also has some really great clothes! 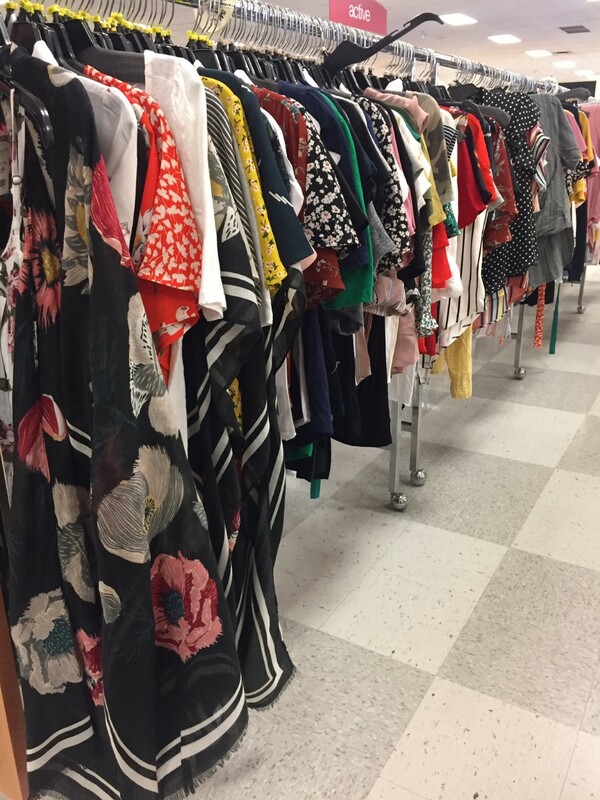 You've got to dig through the racks and you've got to try stuff on, but there are great prices hiding in those racks. I was sad to see rows and rows of crop tops. Not a great look for me, but after digging, I found 6 tops that caught my eye. They were all cute. However, only 3 of them were cute on me. I came home with #1, #4 and #5. Do you have a good TJ Maxx near you?? It's crazy that we're already at the last Friday in February! January went by so slowly and now February is nearly done!?! Bring on March - St Patrick's Day, Spring Break and Fletcher turns 3. I am already having so much fun working on planning his party. I'm no good at dieting. You won't find me counting calories, measuring foods or joining a program because it's just not for me. (Cheers to you if that's your thing - it's just not mine). However, I am focusing on buying real food, preparing real food and fueling my body with good stuff. Here are some of the healthy foods I've eaten lately. I even gave making my own dressing a try. It was a lemon vinaigrette that I loved. Stay tuned for the recipe. Olive hopped off the bus one Friday and she was BEAMING. Happier than I'd ever seen her. 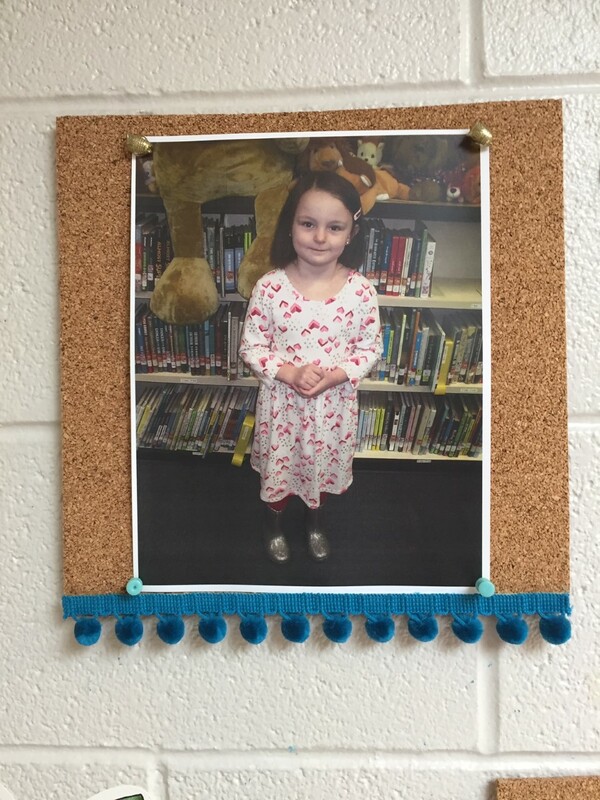 She shouted - I AM THE CHARACTER AWARD WINNER FOR FEBRUARY!! She said she'd been nominated by her teacher and her name was read on the announcements for the WHOLE school. She was so proud. I was so proud. I loved reading the write up her teacher did on her and I was so happy for her. 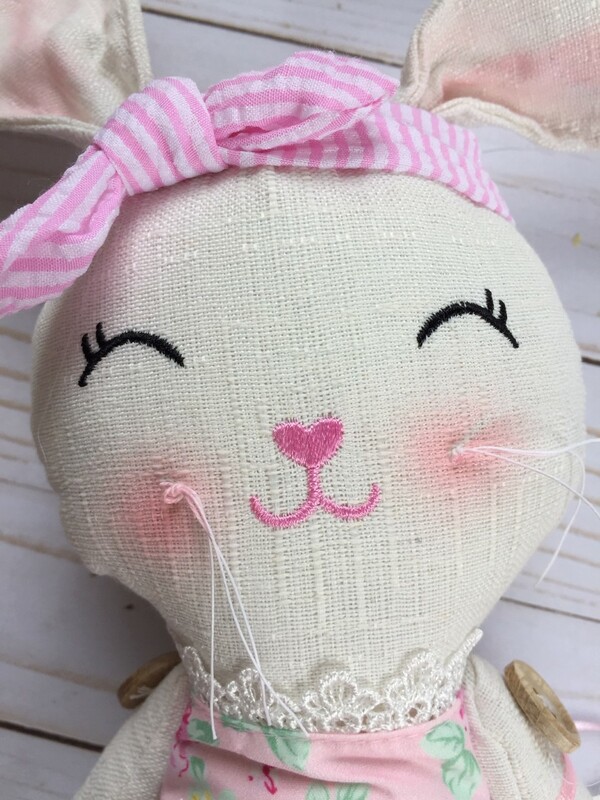 She's been featured all month long and it's been so sweet. 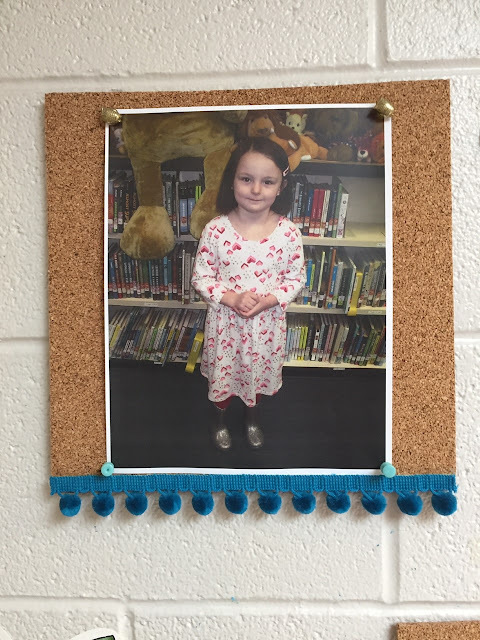 She got to go to a special reception, have her picture hanging in the hall and it's been really fun to see her stand out in a positive way in a big school. We are so proud of her! 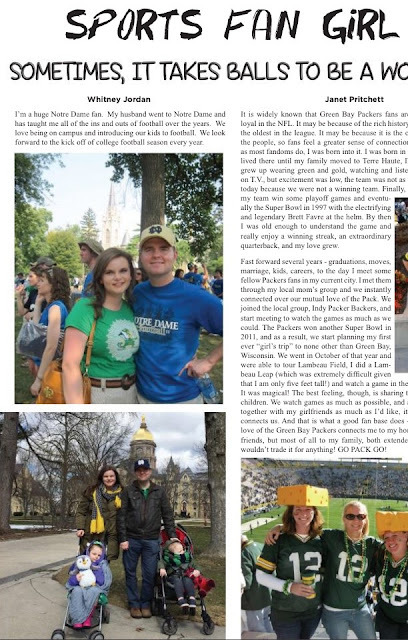 I was thrilled to see my picture and write up show up in a local online magazine. They were doing a special feature on women who love football and I was happy to contribute. I love writing for my blog, but writing for other people is new to me. This month has been full of long weekends and slow starts to our morning. While I'm sure this variable schedule isn't everyone's favorite, it has been a highlight for us. There's nothing better than starting school at 10:00 instead of 8:00 and having a relaxing morning. 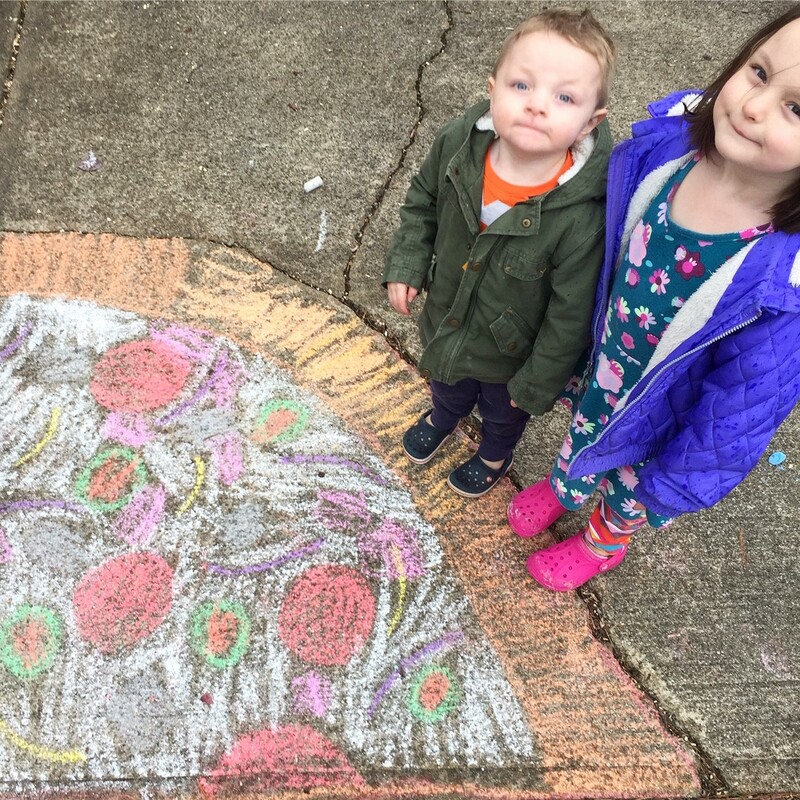 Or having Olive home to do some of our favorite things around town. I really enjoy hanging out with these little people. Both kids are sporting new Nikes. 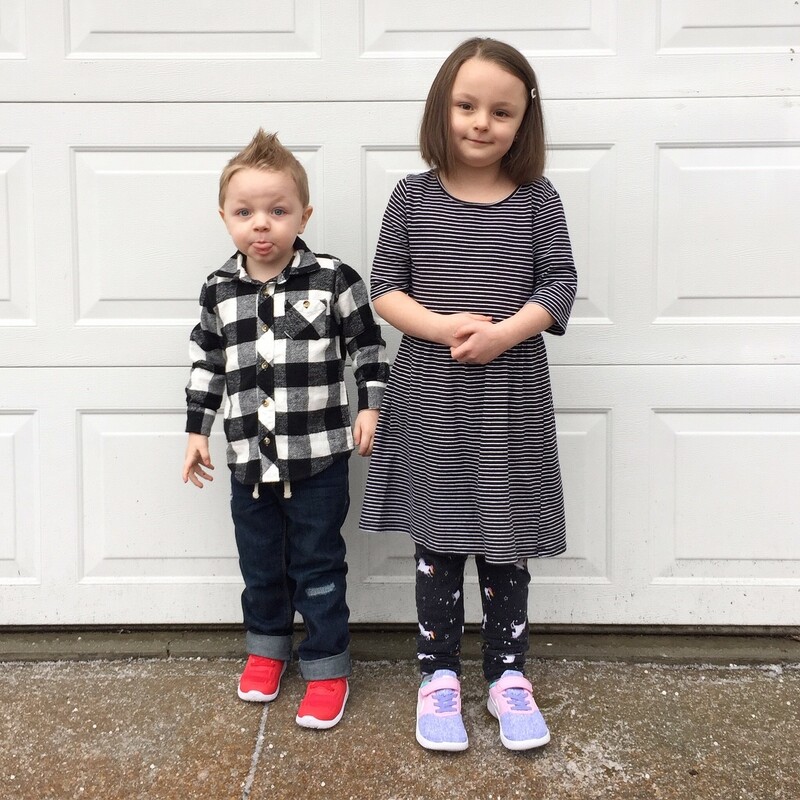 They are the first tennis shoes that both kids approve of other than Crocs. The kids can put the shoes on themselves. They are super light weight and they velcro while still looking like big kid shoes. We love them! 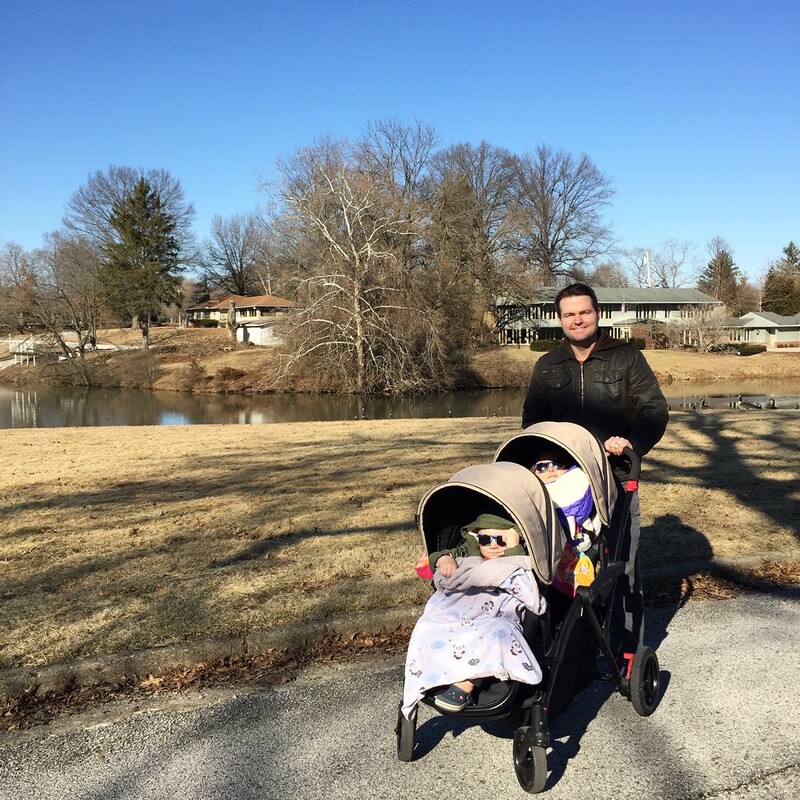 February has been cold and dreary and snowy and freezing in Indiana. We've barely gotten out for any walks let alone to play outside. This sunny walk was a welcome change. I'm hoping the days are going to soon be warm enough that long walks can be a part of our regular routine again. That's my favorite way to exercise. 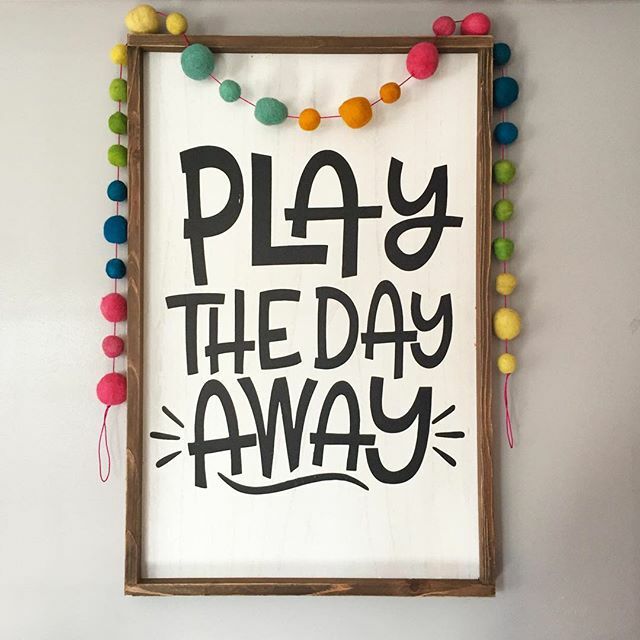 I've been working on putting the finishing touches on our playroom. I am so thankful to have this space. It's actually one of the rooms that made me realize this house was just perfect for us. It has big windows, a window seat, tons of built in shelves and it's right off our family room. We've added curtains, organized the space and are hanging art. 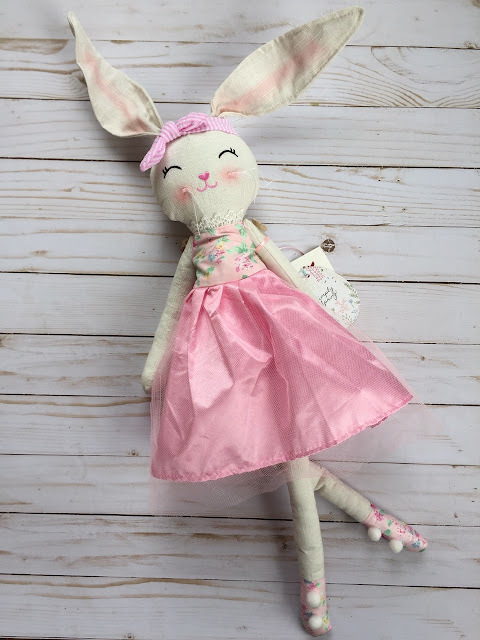 Isn't this a cute Hobby Lobby find?? I'm still hoping to figure out blinds, a rug and down the road paint the built ins. Maybe I'll snap some pictures soon for a little playroom tour. 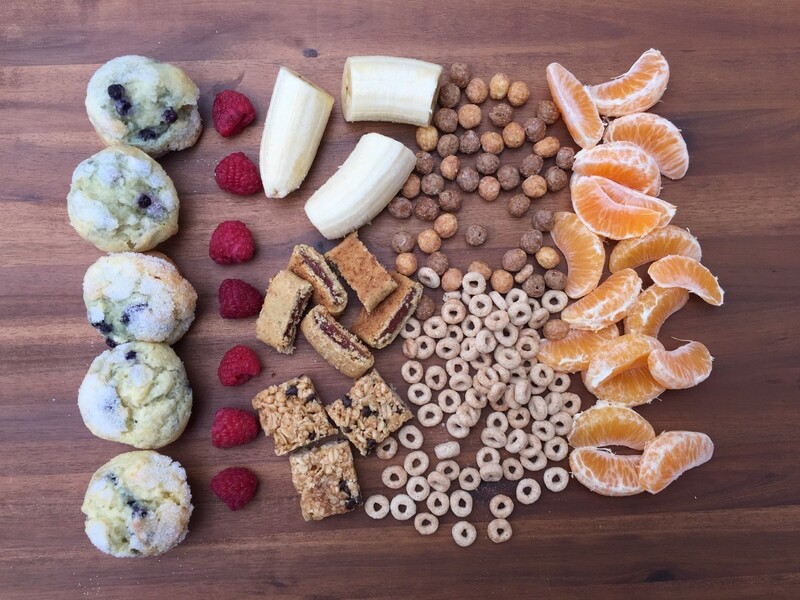 We are still LOVING eating meals on a board. 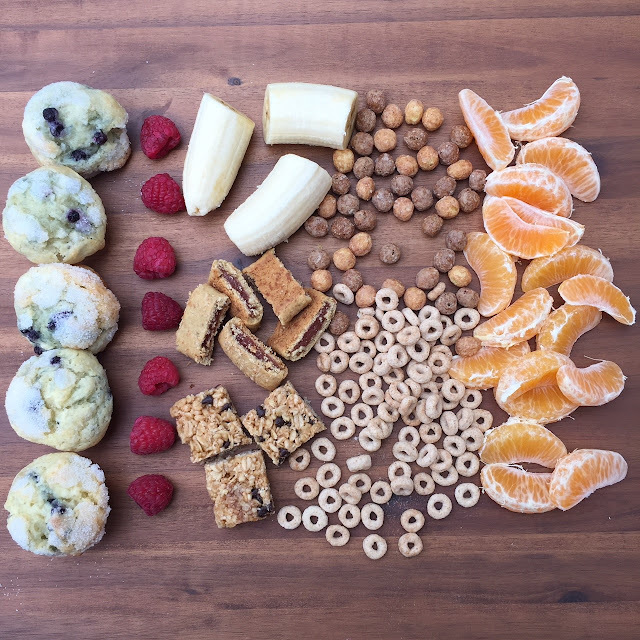 I'll make charcuterie boards for dinner and then we had this fun breakfast board for breakfast one Saturday morning. I love that they're so easy to put together and that it's a great way to finish up the last bits of lots of things. You can go here to read more about this board and ideas for future boards. Have you read Make Something Good Today by Erin and Ben Napier?? I love their show and their book was very good. I'd highly recommend it. You can read my full review here along with several other great books I've read recently. I picked up these dry erase paddle boards at The Dollar Tree this week. My hope was that they'd be a fun way for my kindergartner to practice her sight words and eventually her spelling words. She loved them! They're great quality and erase really easily. I'd highly recommend them. We have had a lot of fun with friends this month! Hope you all have a happy, healthy weekend!! I haven't done a good reads post since October which means I have a lot to catch you all up on! Plenty of good books to recommend to you. I love the show HomeTown with Erin and Ben Napier. It's set in a small town in Mississippi. The show is so charming. Every episode makes me miss living in the South. I love their style on a budget and that they have built a creative team of their friends and neighbors in Laurel, MS. I just knew I'd love their memoir. I was right. It is full of pictures, handwritten notes, stories and inspiration that will leave you wanting to make something beautiful. 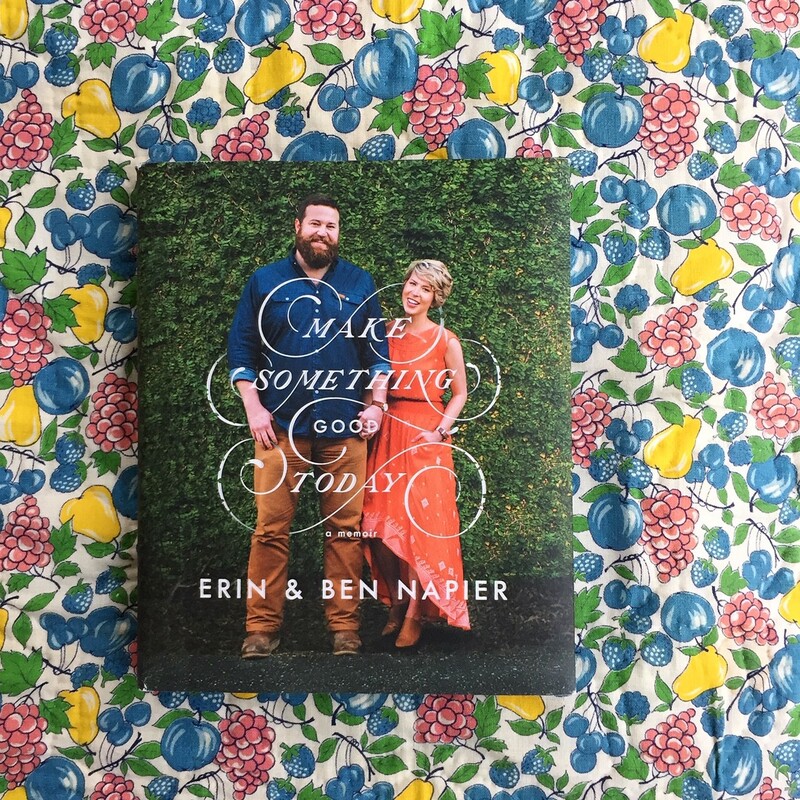 Erin & Ben's life stories are very interesting, but their love story is the most compelling part of the book. They are such a sweet couple. They both take turns writing back and forth throughout the whole book. They give lots of behind the scenes glimpses of their real life outside of the show and insider tips of what it's really like to film their show. Their marriage is filled with tender moments, sweet traditions and the way they have built their business is admirable. They are the kind of down to earth couple that you'd love to be best friends with. 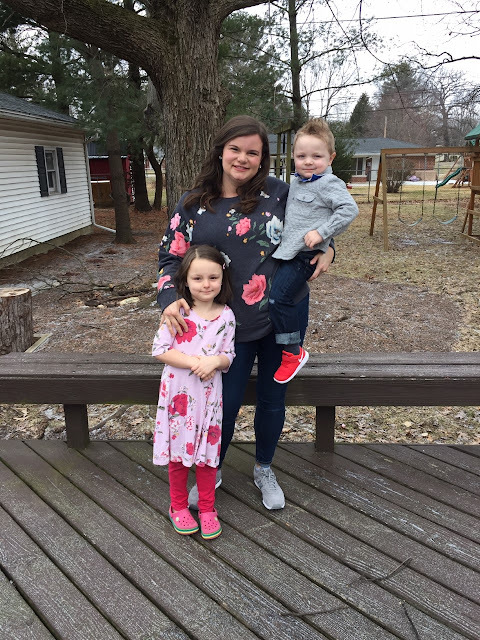 They are new parents and their business is booming. I'd highly recommend this book for some creative inspiration for anything you're interested in doing or for a sweet love story. 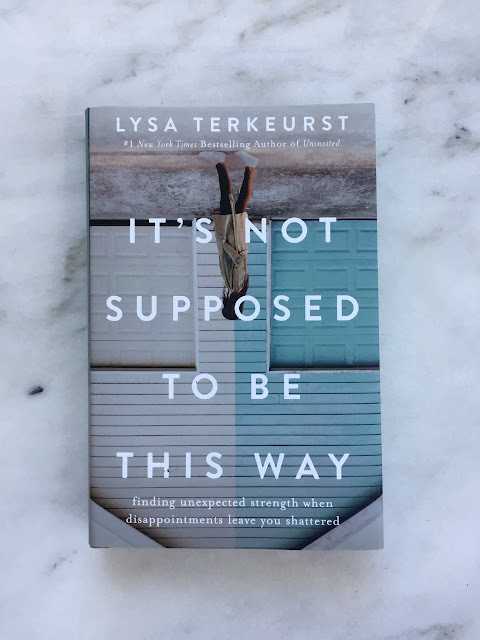 I've read several of Lysa Terkeurst's books over the years so I am always curious when a new one comes out. I was especially intrigued by this one because if you follow Lysa's life much you know that she has gone through a ton of hard things recently - healthy, family, marriage and more. I hated to see her going through all that suffering. As you read the pages of It's Not Supposed to Be This Way you'll feel all the emotions she felt during this hard season. She wrote this book as she was navigating her own personal storms. You can feel that raw, unfiltered vibe throughout the whole book. You know that she knows what it's like to really struggle and she still finds a way to encourage others in the midst of it. The book is written in a way that would be perfect for a Bible Study or small group. There are statements to cling to, scripture to reference, reflection questions and prayers at the end of each chapter. I would have enjoyed discussing this book with a group of women. I'd highly recommend this book to anyone that has gone through hard times or is currently in the middle of them. Lysa would be a good friend to all of them. 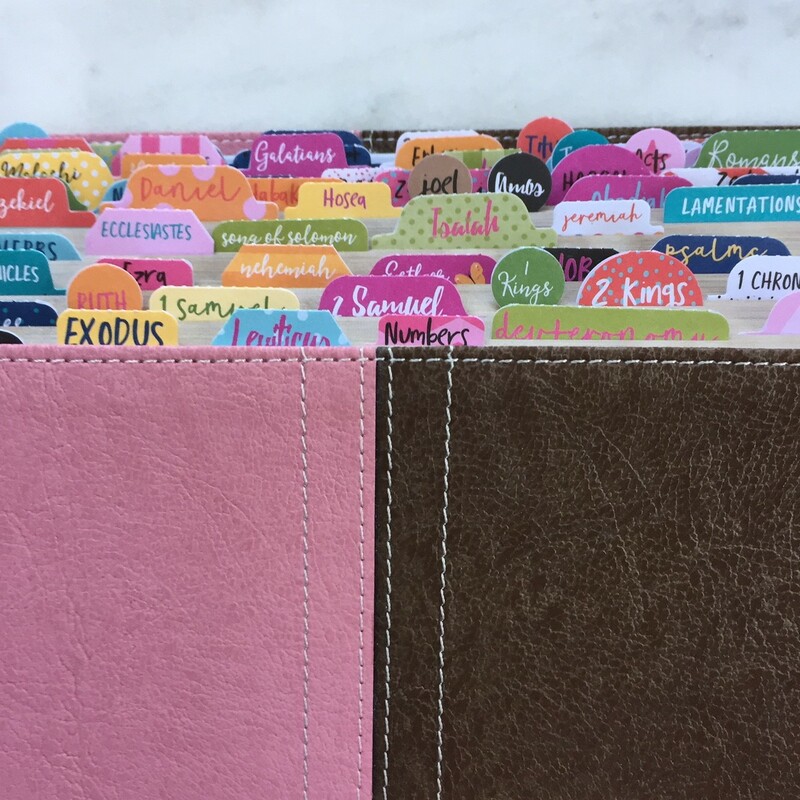 I am really excited about this set of Bible book tabs. 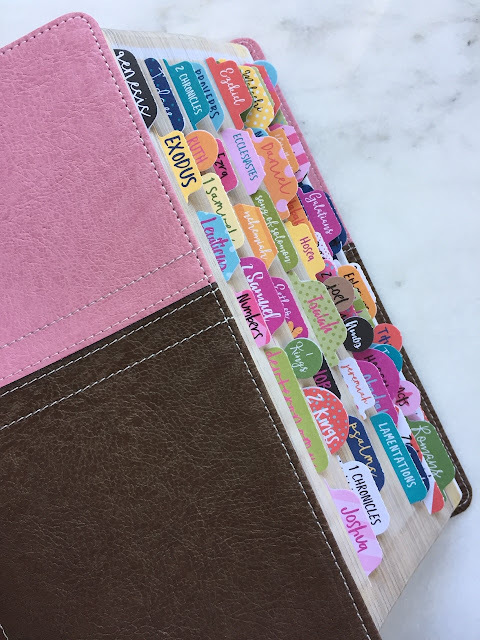 I think they're adorable, add some cute color to my Bible and my real excitement comes from the hope that they'll make my Bible more readable. 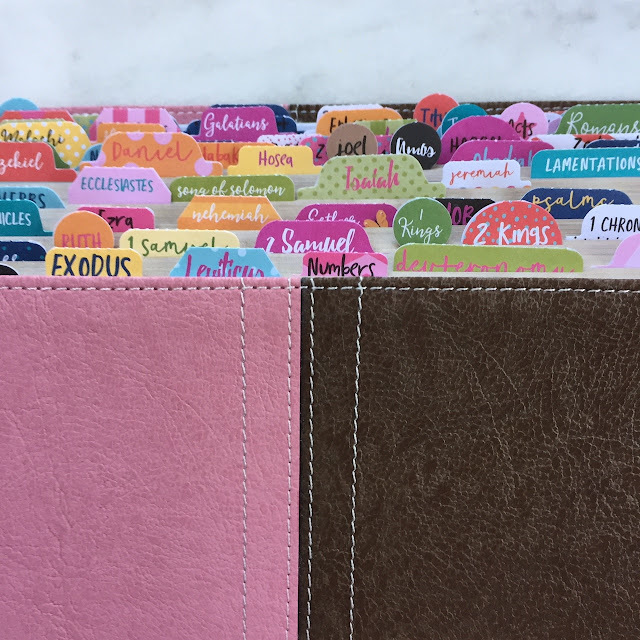 It took me about 30 minutes to put them on my Bible and they seem really durable. They're a pretty reminder on my desk every day to open up my Bible. I have always been a little embarrassed about not knowing exactly where every single book of the Bible is located and now I have no excuse. Just use these cute tabs and get busy reading! We're studying the book of Judges at church and I'm hoping to get into a good routine with my daily quiet time. I've been trying to read more adult books, but the truth is, I spend a ton of time reading children's books to my kids. They love to sit and read. We try to do official book club every day where the three of us each pick out a couple of books and then we read them together. Olive has started asking to read a little so that's a fun development. She's also memorized most of our board books so she will sit down with Fletcher and retell the stories she's heard so many times. They both love it. I was skeptical about this book being an effective potty training aide, but I was WRONG. My son (and fully potty trained daughter) LOVE it. It's funny, clever and the illustrations are wonderful. 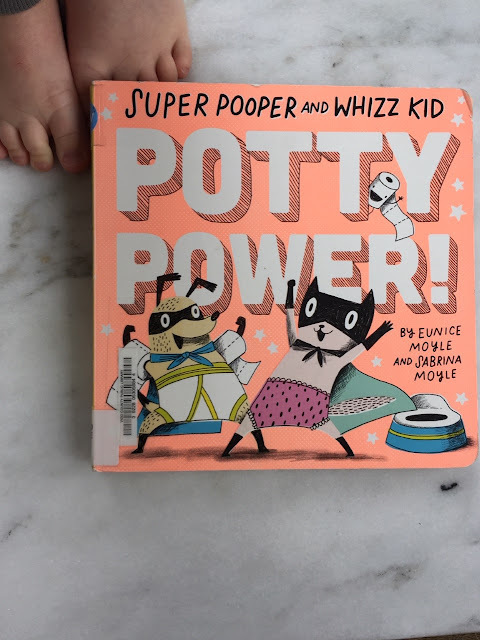 It's a really cute book with tons of potty references and explanations. It is perfect for boys AND girls. It shows both genders and addresses things for both kids unlike many potty training books. 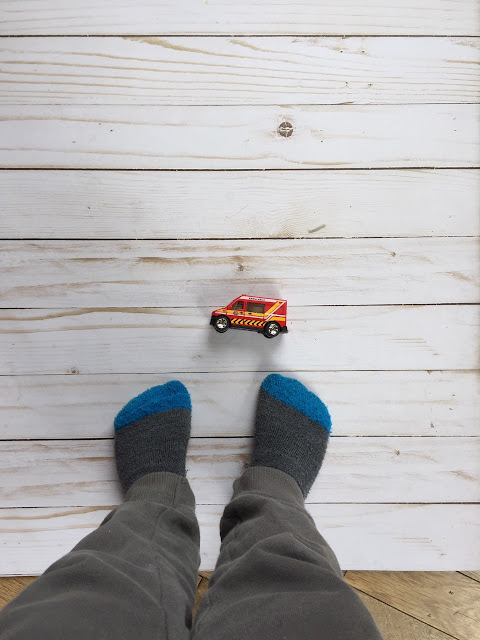 The book addresses everything from bathroom routines, hand washing, accidents and big kid underwear. 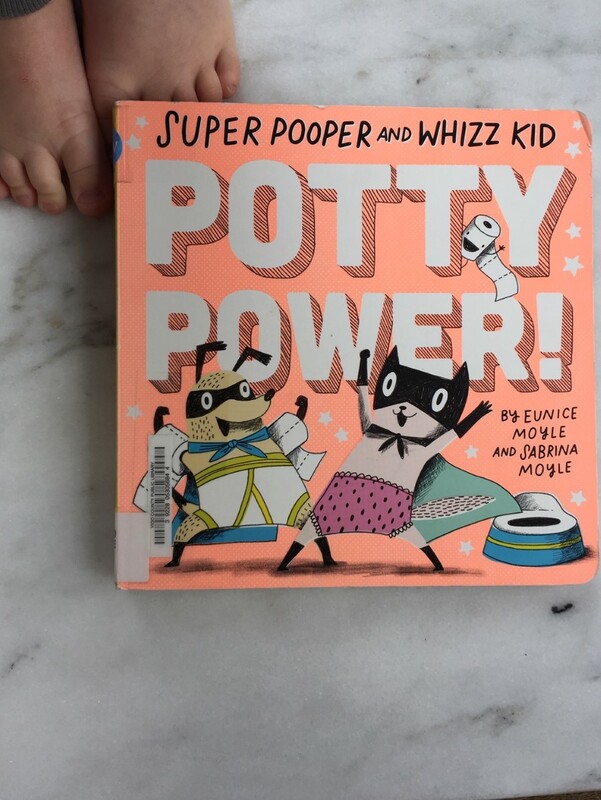 You finish the book feeling like a potty superhero to your family when you've successfully gone to the bathroom. 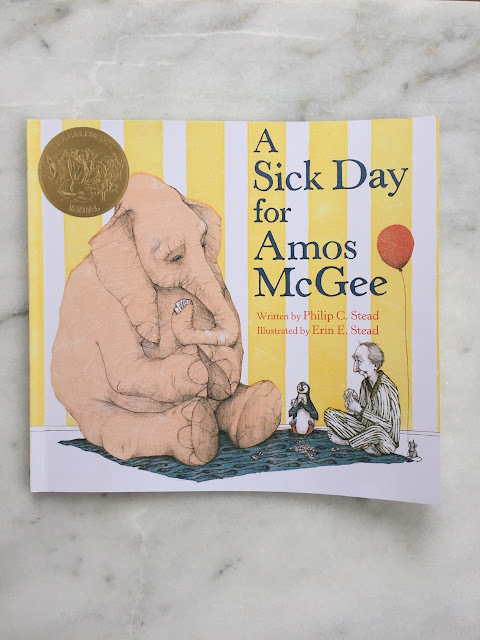 It's really sweet and one I think we'll add to our home library since we are in the trenches of potty training. Pete the Cat first won our heart with Pete the Cat: I Love My White Shoes. His lyrics are so catchy that everyone will be singing along. He teaches colors in the white shoes book and then we're working on simple counting and subtraction in the four groovy buttons book. 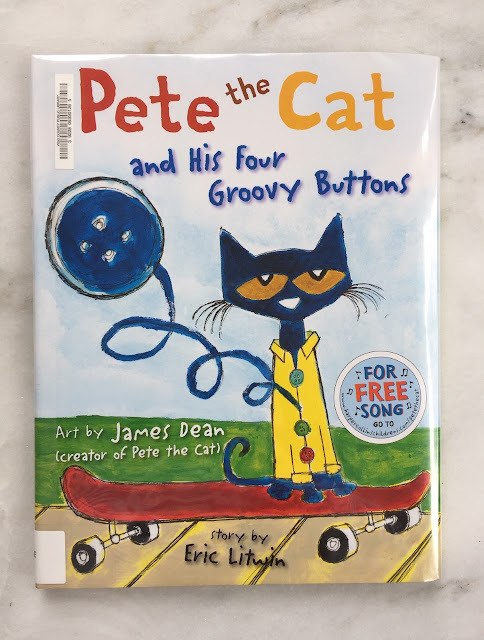 It's great to read aloud and will make you love Pete the Cat even more than you already do. 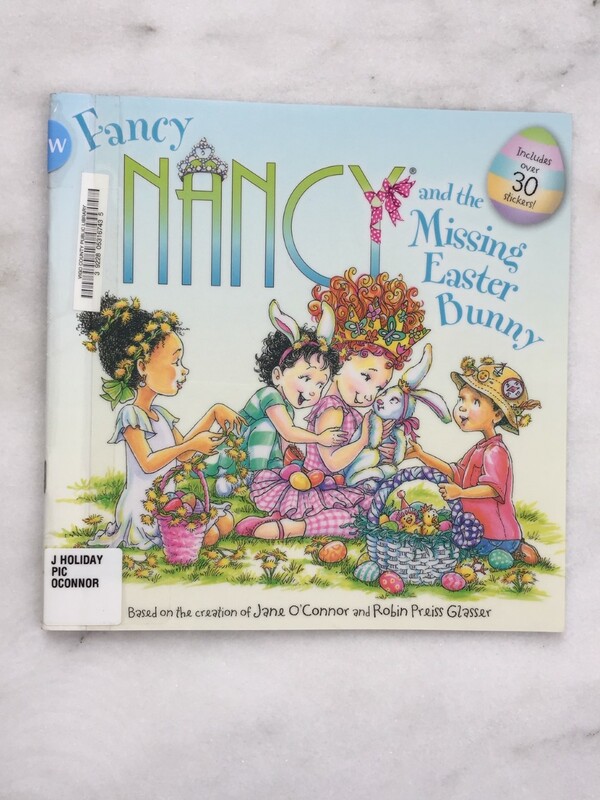 My five year old daughter loves Fancy Nancy. 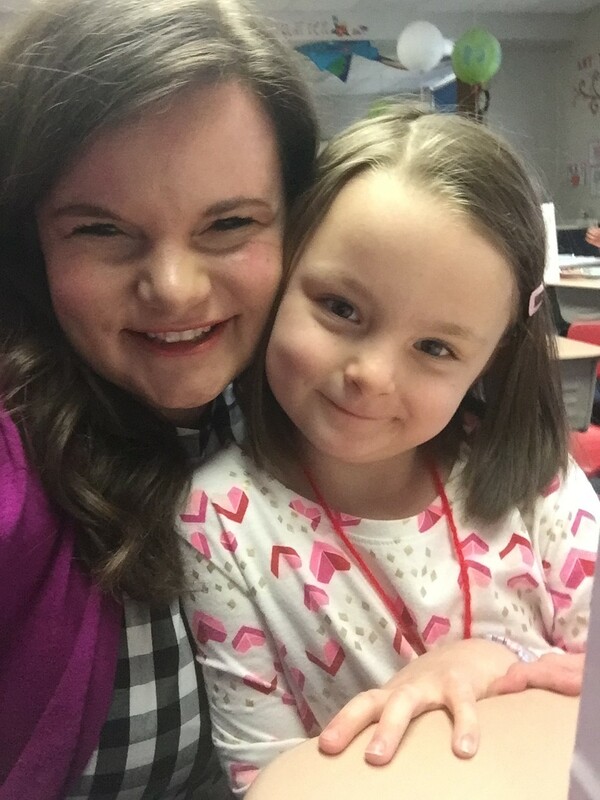 She loves her french words, the new vocabulary she teaches and how everything Fancy Nancy touches turns fancy. The illustrations are so detailed and over the top fancy. Nancy has great ideas and big feelings. Her stories are really relatable to the 5-7 year old girl audience. They fun, funny and easy to read. Good thing there are tons of them! I picked this book up in a Scholastic book order and saved it for a sick day. It's such a sweet story about friendship and caring for others. It's a Caldecott award winning book so it is no surprise that the illustrations are really charming. There's tons to talk about on each page and each character has a personality of its own. We have read this one again and again. **This post contains affiliate links. 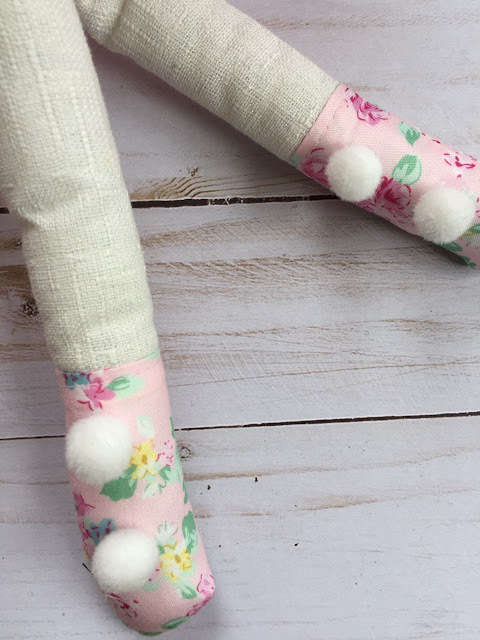 If you make a purchase through those links, Polka-Dotty Place will receive a small commission at no extra charge to you. Thanks so much for supporting my blog! 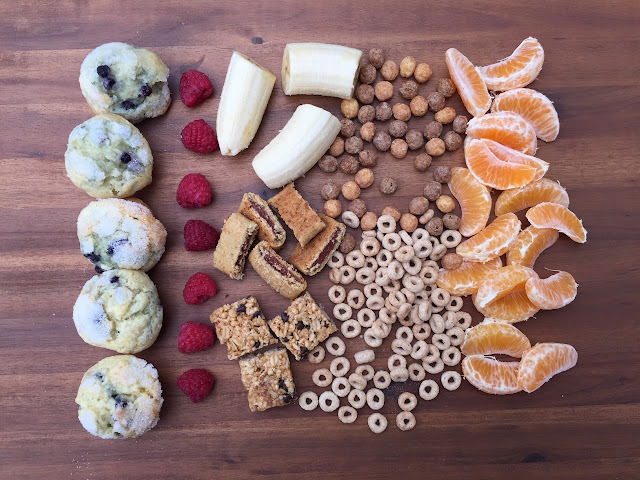 I was looking for a fun, family friendly breakfast to whip up in a hurry and this breakfast board was perfect!! The whole family enjoyed it and it came together really quick. You can customize it to include anything you have in your pantry/fridge. I just used a little bit of everything my family enjoys for this board. I baked a box of Blueberry Muffins from Krusteaz. I almost always bake mini muffins because they bake so much faster than regular muffins. While those were baking, I assembled the rest of the board. We all washed our hands because we started eating. We didn't use any plates. Everyone just grabbed one thing at a time that they wanted to eat and enjoyed this breakfast board. I'd highly recommend doing this for your family or friends. Wouldn't it be fun to put this together for house guests? Slumber party breakfasts? Or a fun weekend breakfast with your family? The menu options are endless.